Video of a woman leaving a 2-year-old boy on a stranger's doorstep in the Houston area has gone viral. 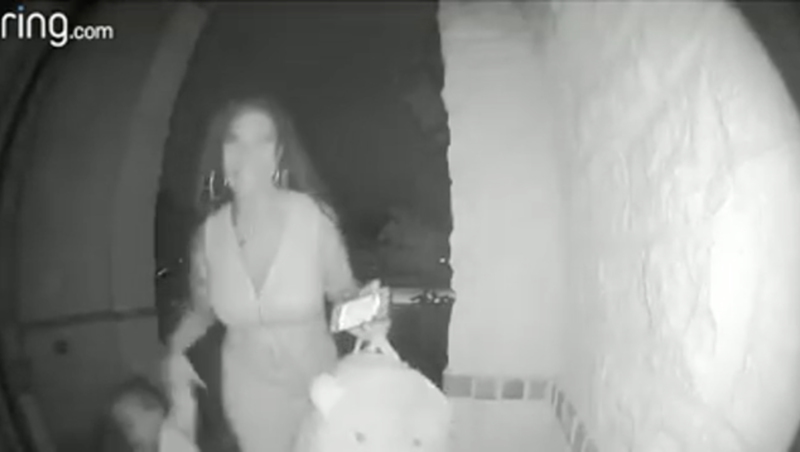 On Wednesday night, surveillance camera at a home in Spring, Texas, captured a woman carrying a child by the arm, setting him down on the front steps and frantically ringing the doorbell. After several rings and knocks on the door, the woman runs off, hops in her car and speeds away. Originally, the identity of the woman and child were unknown. Many people who saw the widely circulated video believed the woman was the child's mother. But on Thursday, the Montgomery County Sheriff's Office released more details about who the mystery woman and child were and the circumstances behind the disturbing scene. Authorities now say the child was abandoned at a stranger's doorstep by a woman who is a friend of his mother, while the mother was in the hospital. The woman apparently mistook the house for the home of the child's father, who lived next door, "then left [the] location without verifying anyone was home or who she was releasing the child [to]," the sheriff's office wrote on Facebook. During a press conference Thursday, Lt. Scott Spencer with the Montgomery County Sheriff's Office said the homeowner who discovered the boy immediately called law enforcement. Officers reviewed the security footage and canvased the neighborhood, asking residents if they recognized the child. The sheriff's department also posted the 23-second surveillance video on Facebook, hoping someone would be able to identify the woman or boy. "During their investigation, detectives learned the father of the child received a text from the mother of the child that a friend was going to drop off the child in the early afternoon," Spencer said during the press conference. "When the child did not show up at the residence, the father assumed plans had changed for the mother and left the home." The child is now in the custody of Child Protective Services, which will determine whether to return him to his family. The boy's mother was in the hospital, the lieutenant said, which is why she did not know the friend left her son at the wrong home. CBS Dallas-Fort Worth reports police do know who the woman is, but have not publicly released her name. "Looks like we have the charge of child abandonment... That is a felony charge," Spencer said. "It was very alarming and very disturbing and my heart was hurting for that child," the lieutenant said about the surveillance video.